Traditional recycled plastic bench ends are perfect for building your own indoor or outdoor bench. The slightly slanted back provides comfortable relaxed seating, and the solid frame is a sturdy base to support your own back/seat materials. The recycled plastic bench ends do not need to be sealed, painted or stained. Colorant and UV protection are molded throughout the plastic to ensure the bench will resist fading. Easy to secure to a flat surface with the optional surface mounting kit for theft prevention. 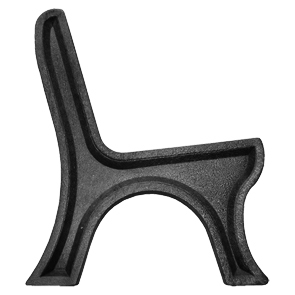 Bench ends can be ordered with pre-drilled holes to fit the Traditional, Deluxe, Elite or Landmark bench styles or can be left not drilled to fit your specific back/seat plank requirements. The recycled plastic is easy to work with and can be drilled with standard woodworking tools. Choose black for an economical color option or opt for green or brown for a more customized look. Bench frames sold individually.